Tulsa, you rocked for many reasons, but you did two things that NO OTHER CROWD HAS DONE for us thus far on tour: 1.) You stayed standing for 30 MINUTES, and 2.) You made sure to chant "USA! USA! USA!" every chance you got!! It had all of us backstage in stitches! Thanks for blowing our minds as much as we blew yours! Ha ha ha. Between songs; when the show was over, after comedy bits, etc. SO. AWESOME. 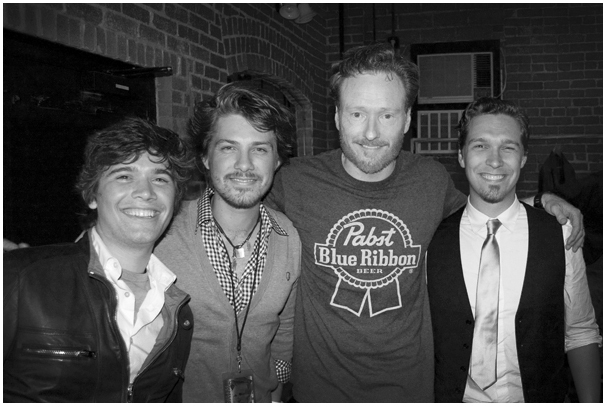 Not only did Hanson blow some minds and break some hearts, but if you've been following our official Twitter account (@ConanOnTour), and my Twitter account (@bigbley), then you got an EXTRA special tweet treat tonight: Hanson interviewing Conan in a live web stream!! Amazing! If you missed it, I'm sorry - hopefully Hanson will archive the video or something. If they do, I'll make sure to let you know. For those of you who caught it... Congrats! I hope it was sweet! (Conan made me wait out in the hall while it happened because he knows how much I dig Hanson). Anyway, a GREAT show, a GREAT crowd, a GREAT musical guest... And a GREAT web surprise! Tulsa, good night and goodbye. Thanks for a GREAT TIME! YOU'RE NEXT, KANSAS CITY. I HOPE YOUR ROCK INSURANCE IS ALL PAID UP.